ACE Certified Instructor Robyn Ramsay is taking on new clients. Originally from California, Robyn has always had a passion for sports and fitness. 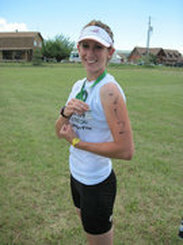 She enjoys cycling, cross country running, swimming, rock climbing and kayaking. Robyn's true passion is helping youth stay healthy and fit. She can also personal train individually or in small groups, feel free to contact her for more information.